BEIJING, Jan. 31 (Xinhua) -- Standing by the pool at the National Aquatics Center, Zhang Lin, Chinese silver medalist in men's 400m freestyle swim at Beijing 2008, is amazed by the transformation of the Water Cube of 2008 into the Ice Cube of 2022. "Every time I came back to the Water Cube after 2008, I wanted to jump into the pool and swim here again," Zhang says. "I won't be able to compete at the Winter Games in 2022, but I will certainly come here to cheer for Team China as a spectator." The pool, a legacy of the 2008 Games where Michael Phelps claimed a record eight gold medals, will be transformed into a curling venue for Beijing 2022. Like the pool, another 10 venues from the 2008 Games will be reused for 2022 as the Beijing organizers aim to deliver a fantastic, extraordinary and excellent Games in a green, sharing, open and clean manner. Thomas Bach, president of the International Olympic Committee (IOC), said he is very confident about the success of the Games during a visit to the Beijing 2022 competition zones this week. "The organizing committee is doing excellent work. We see very thorough and detailed planning. It's the Chinese way. We are really very sure about the completion of the work at the right time and also the success of the Olympic Games," Bach told Xinhua after visiting the Zhangjiakou and Yanqing competition zones on Tuesday. Beijing 2022 will utilize 24 competition and non-competition venues located in three competition clusters of downtown Beijing, Yanqing district and neighboring Zhangjiakou of Hebei province including Chongli. The construction and transition for all the competition venues will be completed by 2020 and ready for the test events, according to Zhang Jiandong, Executive Vice President of Beijing 2022. As the first host city to fully benefit from the Olympic Agenda 2020, the organizers of Beijing 2022 have made great strides in incorporating the Olympic Agenda 2020 and the IOC's New Norm, which is the new way of working spelled out by the organization. "The Beijing 2022 can set a new bench mark for a sustainable Olympic Games, on one hand benefiting from the legacy of the Beijing 2008 and on the other developing a new winter sports destination in a sustainable way," Bach said. Among the 13 competition and non-competition venues in downtown Beijing, which will host all ice sports, in addition to the Ice Cube, the Bird's Nest National Stadium will be used for the opening and closing ceremonies in 2022. This is the iconic venue used in 2008 for the astonishingly choreographed opening ceremony and that hosted Usain Bolt's debut 100m and 200m gold medal wins. The Capital Indoor Stadium, another storied venue where the China and U.S. table tennis teams played each other in 1971 in what became known as "ping pong diplomacy," will be re-purposed for short track speed skating and figure skating in 2022. Located in the northern suburb of Beijing, more than 70 percent of Yanqing district is the mountains. Alpine skiing, bobsleigh, skeleton and luge will be held in this competition zone during the Winter Games. A series of environmental protection measures have been carried out before and during the construction in Yanqing in a bid to deliver a "Green Olympics." The construction includes the transplanting of trees in the mountains 800 meters above sea level. To better protect the trees, experts from Beijing Forestry University conducted an ecological background survey on this area and worked out a protective transplanting plan. "Whichever venue we are visiting, we could see what would be the use after the Olympic Games. Part of the legacy program is the environmental protection. There to see that millions of trees being planted as forestation. This is another example of Olympic Agenda 2020," Bach said. At the Xiaohaituo mountain of Yanqing, a group of Chinese architects developed their own technology to build the world's 18th and China's first track for bobsleigh, skeleton and luge. The construction of track has a strict requirement in shotcrete, demanding numerous experiments to achieve a certain degree of concrete thickness. The successful research and development of shotcrete has been certificated by the International Bobsleigh & Skeleton Federation. The National Skeleton and Luge Center has also developed a technology called a "Climate Protection System" combining the landscape, track and sun shield roof, which will save energy and reduce carbon emissions. 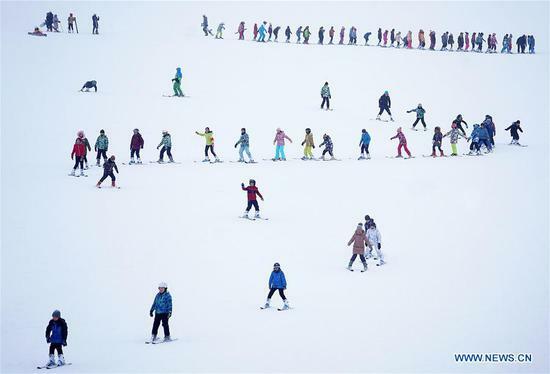 As the host country gears up for the Games, the small town of Chongli, about a four-hour drive north of China's capital and once one of the country's poorest areas, is now home to seven ski resorts and will host skiing and biathlon in 2022. Transportation integration will further put the Games and the development of the region on a fast track as a high-speed rail link from Beijing to Zhangjiakou and Chongli is anticipated to slash the travel time to only 50 minutes when it goes into operation in 2019. In January 2019, Chongli was selected by New York Times as one of the "52 places to travel to in 2019" for its booming ski industry. "The lead-up to the next Winter Games is well underway in and around Beijing, and the spectacle is breathtaking. The most stunning transformations are happening in Chongli. Go now to see firsthand how the world's most populous country is working overtime to become a competitive winter sports nation," the newspaper said. As the 2022 Olympics makes Beijing the world's first host city of both a Summer Games and a Winter Games, a group of Chinese people have also gained the opportunity to serve the Olympics twice. 15 years ago, at the age of 35, Li Jiulin was appointed as Chief Engineer of the construction of the Bird's Nest. At that time, no one had the experience in China to deal with such complicated structural steel construction. Li and his colleagues completed 13,520 construction drawings on the basis of 150 designs and eventually built the Bird's Nest. Now Li is leading his team to build the National Speed Skating Oval, dubbed the "Ice Ribbon," the only new permanent ice-sports venue for the 2022 Games. The 50-year-old is much more confident now than he was a decade ago because of the experience and technologies he has accumulated from the Bird's Nest project. "Any architecture is a reflection of its era. The building of the Beijing National Stadium launched a new era in China's construction industry, and has drawn a variety of innovations, many of which have been upgraded in the following years and will be applied to the National Speed Skating Oval," added Li. Beijing 2022 also gives new life to the old site of Shougang, once the burning heart of Beijing's industrial complex, whose entire steel-making complex was relocated out of Beijing in the run-up to the 2008 Games. It is now not only home to the Beijing 2022 Olympic Games Organizing Committee, but also being transformed into big air snowboarding venues for the Games. Beijing 2022 is also embracing Olympic Agenda 2020 by working more closely with the International Federations and former Games organizers on venue and sports delivery. From November 2017 to March 2018, Beijing 2022 sent a total of 254 staff members to PyeongChang 2018 to get first-hand experience by working in key roles in the local organizing committee or joining in an observational capacity. Since its launch in February 2017, Beijing 2022's marketing program has seen a great success. The eight official partners signed are Bank of China, Air China, Yili Group (dairy products), ANTA (sports apparel), China Unicom (telecommunication services), Shougang Group (urban regeneration services), CNPC (oil & gas), and Sinopec Group (oil & gas). Some of them were also official partners of Beijing 2008. The organizers have adopted a series of new measures to attract sponsors. China National Petroleum Corporation (CNPC) and China Petrochemical Corporation (Sinopec Group), two global energy giants, became official oil & gas partners of the Games by sharing marketing rights in the oil & gas category. Chinese beer brands Tsingtao and Yanjing have also been named the official beers in a similar arrangement. The emblems of the Beijing 2022 Olympic and Paralympic Winter Games, respectively named "Winter Dream" and "Flying High," were unveiled in the end of 2017. Beijing also issued a worldwide call for mascot designs and for opening ceremony proposals last year. When the school year began in September last year, elementary and secondary school students across China were encouraged to create their own mascots for the Games in art classes. "Sports set the stage for a stronger and more prosperous country," Chinese President Xi Jinping notably said. The president also said that every individual's dream and the country's dream of becoming a strong sports power are closely linked with the Chinese Dream of the nation's great rejuvenation. For Chinese athletes, the 2022 Winter Olympics is the best chance to realize their dreams. Lacking an established tradition of winter sports, China had had no presence in around one-third of Winter Games disciplines by the time the country won the bid to host the 2022 Games. After the country won nine medals, including one gold, in PyeongChang in 2018, a grand plan was put forward to have China compete in all 109 disciplines in 2022. The last time a host nation participated in all available disciplines at a Winter Olympics was the U.S. at Salt Lake City 2002, when only 78 disciplines were available. "After the PyeongChang Games, we established national training teams in all 109 disciplines within a year," said Ni Huizhong, Director of the Winter Sports Administration Center of the General Administration of Sport of China. By October 2018, Chinese national training teams contained a total of 4,004 people, in comparison to just 499 in 2014. Among them there are 3,257 athletes, up from 345 in 2014. Chinese national training teams have expanded their selection pool by choosing suitable athletes from summer sports and schools of dancing and martial arts. Around 1,200 athletes entered the team through these channels. To better serve China's national ice sports teams, four new training venues have been built in Shougang Industrial Park. These venues, commonly known as the "four ice rinks," were all converted from disused powerplants. "Great changes have taken place in the Beijing Olympic cycle. This brand new training venue has been built for the 2022 Games. In the past, we had to travel around China and overseas to prepare for the Winter Olympics, and it was very tiring. But now we have top training facilities here at Shougang," said Ba Dexin, China's men's curling team captain. Wu Dajing, the men's 500m short track speed skating Olympic champion and world record holder, is eager to challenge himself over longer distances. "Everything we are going to do is for the 2022 Beijing Olympics. My dream is to win golds at home," the 24-year-old said. "I want to make breakthroughs not only in the 500 meters, but also in the 1,000 meters, 1,500 meters, 5,000 meters relay and 2,000 meters mixed relay." Five-time Olympian figure skater Zhang Hao is still fighting on the rink. "It's an once-in-a-lifetime chance. I am always ready for 2022," the 34-year-old said. China has also sought to learn from other countries and regions with a rich history of winter sports. The year of 2019 saw China and Finland inaugurate the China-Finland Year of Winter Sports, which will see China's cross-country skiers, biathletes and ice hockey players training in Finland, while ten Finnish coaches have come to China to share their training methods and philosophies. To broaden the influence of the Beijing Games, China has plans to encourage 300 million people to take part in winter sports. "We can see the great progress, but what is even more important is we can see the plan raised by Chinese President Xi Jinping to make 300 million people familiar with winter sports obviously already works. We have met many children who love winter sports. We have seen athletes practicing winter sports. We have seen the halfpipe and other slopes which are already hosting international competitions. The progress is really impressive," Bach said. "Just think about the 300 million participants in winter sports. It is a remarkable contribution to the Olympics in itself," said Yang Yang, former IOC member and current Chair of the Athletes' Commission for Beijing 2022. Yang's comment was echoed by Gilbert Felli, Senior IOC Consultant and former Olympic Games Executive Director. "The 300 million plan's contribution towards the Olympic movement is clear. China is becoming an important winter sports nation," he said. While China's northeastern provinces have long been the epicenter of the country's winter sports, increasing numbers of indoor ice and ski arenas are now being constructed in China's sub-tropical south. Ice rinks can even be found in shopping malls in Haikou, capital city of Hainan, China's southernmost province that boasts a tropical climate. "Promoting 300 million people to participate in winter sports is not only your aim, but also the IOC's aim. The IOC and international winter sports federations will jointly support China," Chair of the IOC Coordination Commission for Beijing 2022 Juan Antonio Samaranch said. Three and a half years after Beijing was awarded the 2022 Games, Yue Haile's monthly income has risen almost fivefold to nearly 5,000 yuan (around 740 U.S. dollars). Yue, a Chongli native, became a coach in a local skiing club, which marked a turning point in her life. Yue is employed by the club owner Zhang Yan, who started his skiing business in the county ten years ago. At that time, the impoverished county had a population of only 30,000 and there was only one hotel available for travelers to stay in, Zhang recalled. "But I found that there are more places suitable for skiing in Chongli than in Beijing. The ski track is longer and it is much more enjoyable to ski here, and it is not far from Beijing," said the ski enthusiast. With a firm belief that Chongli would become a popular ski destination in the future, Zhang opened the first three-star hotel in Chongli in 2009 and launched a ski training club five years later. "I think it will only take five years for China's winter sports industry to reach the level that other countries spent 50 years to get to," Zhang estimated. In the past few years, the economy of Chongli and Zhangjiakou has thrived, with rapid development in transport, industry and the environment. Many locals, who previously left the region in search of better job opportunities elsewhere, now work in their hometown's skiing industry. Thaiwoo, one of Chongli's ski resorts, recorded a 35 percent year-on-year increase in tourists in the 2018-2019 season. "Living comfortably at home, we don't have to wander out and leave the children to the elders," Yue said. Surrounding Beijing and Tianjin geographically, Hebei Province, in which Chongli is located, lags far behind the two cities in terms of economy and public services, and its counties bordering the two cities were once described as a "poverty belt." The transformation of Chongli has been largely attributed to the preparation of the Winter Olympics, which sped up the poverty alleviation process. "The organization of the Games is important, but it is just one part of China's long-term development strategy. It is contributing to the social development of China," Bach said. China has set 2020 as the target year to finish the building of a moderately prosperous society in all aspects, with poverty eradicated and GDP and per capita income doubling that in 2010. In the process, Beijing 2022 is considered a historical opportunity to speed up the development of the Beijing-Tianjin-Hebei region. "The whole world knows the Winter Olympics, but doesn't know how poor Zhangjiakou used to be," said Communist Party of China (CPC) Zhangjiakou Municipal Committee Secretary Hui Jian. "Hebei had ten poverty-stricken counties, among which Zhangjiakou had five." Hui is dedicated to leading Zhangjiakou out of poverty through Beijing 2022. "By 2022, Zhangjiakou will not be what it looks like now. Zhangjiakou will become a window of a moderately prosperous society," Hui said with confidence.